GALENA PARK CITY COUNCILWOMAN LOIS KILLOUGH finishes her statement to the public on her resignation from the City Commission, or Council, and the reasons why she feels that she cannot continue to serve the public properly in the “circus” atmosphere created by Mayor Moya. 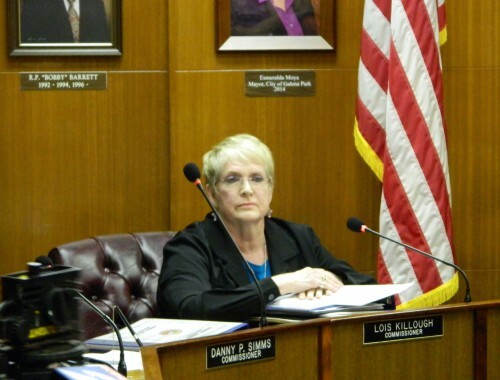 GALENA PARK – In a dramatic statement made at last Tuesday’s City Council meeting, Lois Killough read her resignation message, and at the end of the meeting quit as a member of the City Commission. She held Position #2, responsible for the police and fire departments. Killough had been elected last May 2014, along with new council members Maricela Serna and Juan Flores, Jr. with the idea that they would bring fresh ideas and changes to the city government. Esmeralda Moya also campaigned for Mayor on these ideas, but with the promise that she would change department heads and “clean up” the way the city was run. Her confrontational style was obvious after she took office, when she immediately changed locks on City Hall doors and fired the City Administrator and demoted the Police Chief, at least temporarily. The new council members and one remaining, Danny Simms, were not able to work with Moya, nor concur with her decisions and methods, and council meetings and governing soon deteriorated into chaos, according to Killough. I have lived and worked in the Galena Park and Northshore communities for 50 years. I have served on County Boards, PTA Boards, Retired Teacher Boards and many other community organizations. I led a staff of about 110 people and a student population of 1000 students. I hoped to be able to improve the city of Galena Park by serving on City Council. All the new commissioners and the mayor were required to attend training. We were trained in how to legally run city council meetings and our charters were explained to us by legal experts. I am not able to properly serve the people who elected me because of the actions of the mayor. She refuses to run a legal council business meeting. During her campaign she violated many rules of the Ethics Commission. She has not filed appropriate campaign finance reports. She has threatened council members. She has illegally fired city workers. In her hunger for power, her actions and the many frivolous lawsuits she has filed have cost the taxpayers $100,000 to date. She filed a lawsuit to freeze the city bank accounts. She refused to sign a contract that kept our sewer plant operating. She has lied to voters promising to lower their water bills. We purchase 90% of our water from the City of Houston. They can charge whatever they like and their fees will only go up. Shame on you, Mrs. Moya. DR. ALAN LAMBERT, M.D. 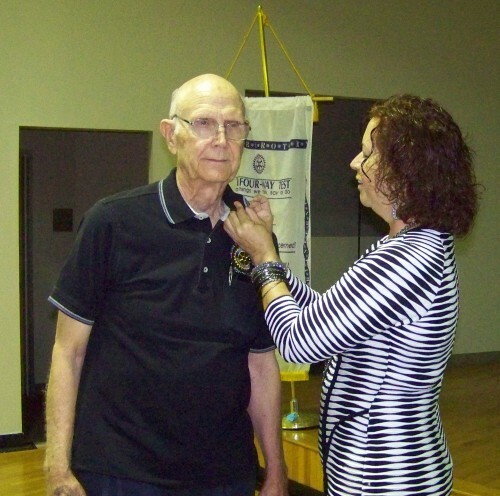 receives a perfect attendance pin from Rotary Club president Maria Rodriguez, for his 60 years of faithful perfect attendance with the club. GALENA PARK – The Galena Park/Jacinto City Rotary Club held their annual Officers and Board installation ceremonies last Wednesday, July 15th. One of the important awards was given to club member Dr. Alan Lambert, retired medical doctor, and a Paul Harris Fellow with Rotary. Attendance is an important part of Rotary membership, but not many achieve the record that Dr. Lambert has. Dr. Lambert is now 89 years old, and was a family doctor since 1953, practicing in Jacinto City until his retirement in 2014. He also was affiliated with Baylor College of Medicine, on the faculty and practiced family medicine there since 1976. GP/JC Rotary was pleased to honor Dr. Lambert at their annual awards ceremony. Sheldon ISD announced recently that Mr. John Kirchner will be serving as the Interim Superintendent for Sheldon ISD during the period of time that the District conducts a search for a new full-time superintendent. Mr. Kirchner is the current Assistant Superintendent for Administrative Services and the school district has full confidence in his ability to guide the District through this transition period. I am grateful to have had the opportunity to work alongside you in this wonderful district. When I came to Sheldon ISD seventeen years ago, I did not imagine that the path I had put my feet on would lead from the Dean of Instruction position at C. E. King High School, to the role of Assistant Superintendent of Instructional Services, and finally to work as Superintendent of Schools in this great district. 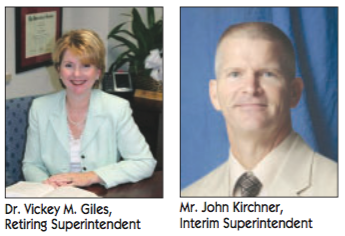 It is you – the people of this district – who make this a great place for our students! We have laughed together, cried together, worked together, played together, and celebrated our successes together as we have made this district stronger each year. Now I will begin a new journey. I will be retiring as superintendent of Sheldon ISD on August 31, 2015. I am grateful for the eight years I have been privileged to serve as superintendent of Sheldon ISD. The board of trustees truly has a heart for the children of this district and they have supported our efforts to constantly learn how to better educate our students.